“William Golding of Boston set up shop as a printer’s supply house in 1869 and soon graduated to the manufacture of seals, then small amateur presses, and finally full-sized jobbing presses. (See also Golding’s Jobber and Pearl.) 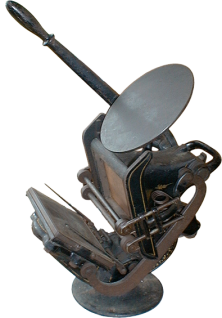 Presses in the Golding Official series ranged from a lever press with a platen of 2×3 to a self-inking floor-model jobbing press with a 10×15 chase (the Official No.6). The tabletop Official No.2, above, closely resembles the Sigwalt Nonpareil, designed by John Sigwalt to imitate the Official. The two presses can be distinguished by their roller springs: those of the former are coiled outside the roller arm (as shown, in a view from behind the inking disc), while those of the former are coiled around the arm of the roller hook in a more conventional manner. This Official has a serial number of 1098 and was manufactured September 17, 1884.